Ladies Coupe was the book our book club - This Book Makes Me Cook - chose to read for December. Anita Nair's story is about journeys - a train journey for Akhila, our middle-aged heroine who's on a quest to discover some answers for her life. But also a journey through her past, and through the lives of her other co-travelers. Through the life stories of the women in her Ladies Coupe, Akhila seeks to find answers to her dilemmas. The book's well written, and even though I don't agree with most of Akhila's (and by extension, Anita Nair's) view of life the book never got boring. It moves at an even pace, the train journey happily coinciding with the life stories of these six women. Picking a recipe from the book was easy. For when the train stops at a station midway, Akhila and one of her travelling companions venture out to have the soft, lacy appams. This post has been a long time coming. What I have tried to do is create a ready reckoner of my favorite restaurants. Not a list of all restaurants I like, mind you! Instead, this is the list of the best for each genre. It's classified the way I get my eating out cravings. And I've also typecast restaurants by how pricey they are - the prices are for meals for two, minus the drinks (and very general ranges that vary considerably for me). 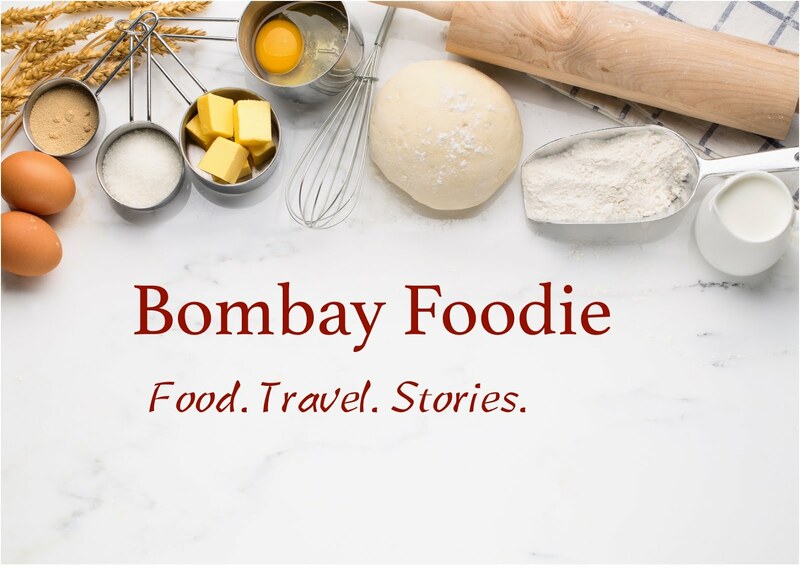 I hope this points you in the right direction if you find yourself in Bombay. Or, in this case, I was given brownies too fudgy for their own good. See, I wasn't too happy with the brownies I made last week. Then, when browsing the archives of Min, my taste & create partner this month, I came across Moosewood Fudge Brownies. Min said they were the best of brownies, so I went ahead and made her recipe. Trust me, I followed the recipe exactly as Min wrote it. The only change I made was to scale it down to a 2 egg recipe from Min's 5. But at the end of 25 minutes, the recommended baking time, my brownies were not set. And they were too soft at the end of 30, even 35 minutes. But the toothpick came out clean and I took the brownie pan out of the oven thinking they will harden as they cool. But they didn't. Not at all, not even when they had cooled for around half an hour. That's when I decided to cut them into squares and disaster struck. The brownies fell into a heap, more of a brownie halwa than a fudge. I live next to the biggest grocery store in Mumbai. And because "Hypercity" has pretty much every hard to find exotic ingredient you can buy in India, I rarely venture elsewhere. Except I was out shopping and landed up in Food Bazaar last weekend. What a shock it was! There was this whole section of stuff I never thought you could buy - Tamilian style chillies dried in yogurt, idli podi, garlic chutney powder, dried lemon pickle and lots of other stuff I can't name. And then, the vegetable section was another shocker. I found green wheat, folks! Another excellent addition to my salads was ragi sprouts, something I never knew existed. But my proudest buy that day was a pack of green lima beans. I love beans and this is one kind I have never tasted before, fresh or dried. Clearly, I was in awe of my shopping. Ignorant as I am in all things in fried snacks, this was my first reaction to this month's Indian Cooking Challenge. Srivalli picked this apparently very popular "ring murukku" as the December challenge. Since I rarely buy any fried snacks, this was a totally new world to me. I picked the simpler of the two recipes we were given to choose from. It involved making a dough from rice flour, plain flour and hot water with some spices added in. Then you pinch lemon sized balls, pull them into ropes and bring the ends together to form the rings. The chegodilu rings are then fried in hot oil to what should be a crunchy snack. Mine never got too crisp though. But even with the crunch missing, it was delicious and gone in a few minutes. I just made one-third the recipe, all right. And of course, I ate it all myself. Wouldn't you? I've never baked brownies before. No, really! I've eaten tons of them. Most of the time, cafes and restaurants seem to have brownie with icecream as the only half-decent choice for dessert. But I don't think I've given too much thought to brownies per se. Except last week when I was browsing Shaheen's beautiful blog and came across her recipe for Baked brownies. I know all brownies are baked, but these were made with a recipe from Baked, the famous New York bakery. They are quite simple to make too. Melt 90 grams butter and 130 grams chocolate in a microwave. Let cool to room temperature, then add 3/4 cup sugar and mix. Beat in two eggs, one at a time. Add 1/2 tsp vanilla essence, then fold in 1/2 cup flour that you have mixed with 1/2 tbsp cocoa powder. Pour everything in a foil lined 7 x 5 baking dish, top with walnuts and bake for 20-25 minutes. Let cool, then cut into squares. But you don't get to see it. Sometimes I can't believe how incredibly stupid I can be. See, I set to make Ciabatta, the Italian flat-ish bread used to make sandwiches. I picked the best recipe there is, from the fine folks at King Arthur's Flour. And it was a lot of work. You make a sponge overnight. Then you knead this dough with a processor. It's so soft, almost batter like, that my favorite kneading by hand method is impossible. The first rise was impressive, but the dough was still too soft. Which should have told me to use parchment. But stupid me went ahead and plonked the ciabattas on a greased baking sheet. It rose, it browned, it smelled wonderful. But it stuck! I could not get the bread off the baking sheet. That's Swati Snacks in Mumbai's Tardeo for you. When you first look at their menu, full of homely comfort foods, you can't really understand the crowds in this small-ish eatery. Neither did I first get the long queues waiting patiently outside. But a meal is all it takes to convince you to make long, arduous treks (at least for me!) to eat a meal that gets over too quickly. First, there's Panki, A thin rice flour crepe cooked between two banana leaves. This method steams rather than fries the batter, leaving you with super soft pankis. Every panki comes with a pickled chilli, the high point of the dish if you ask me. But there's also a coriander chutney and a sweet mango sauce if you are interested. Pickles are serious business in India. Because quantities are huge and the room for error high, only the eldest women in the household take on pickle making. When my mother took on pickle making many years ago, it was with the combined consent of her mother and her mother-in-law. Recipes from both my grandmothers, closely guarded and never written down, were enhanced with experience and tips from friends over the year.